A few years ago my wife developed an obsession for Lemon Italian Ice, to the point that I was going to Rita’s about three or four times per week. They got to know me pretty well that summer. 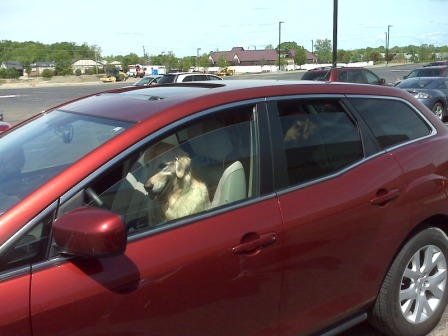 In fact, when I pulled into the parking lot, they started scooping my quarts for me. She likes a lot of flavors — mango, raspberry, peach, cherry, to name a few — but her favorite by far is Alex’s Lemonade. I bought three to four quarts every time I visited Rita’s. Although we did our best to keep Rita’s in business, summer came to an end, and the Italian ice stand closed for the year. I tried to stock up on lemon ice as best I could, but we were out of “icee”, as my wife calls it, by the end of October. 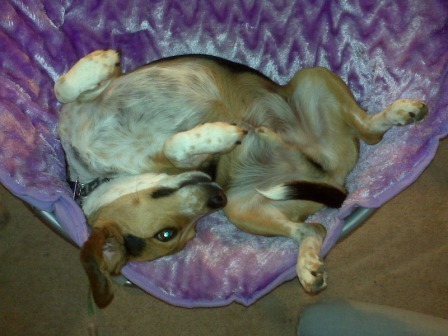 Those were desperate days in our house. We tried some store brand Italian ices, called around, and checked the internet for other places we could get icee. But all to no avail. There was no good substitute for Alex’s Lemonade to be had. Finally, my wife and I were talking about it, and I asked, “How hard could it be to make Italian ice? I mean, it’s basically sugar, water, and lemon juice, right?” And thus began several months of experimentation — the details of which I will spare you — which resulted in the following recipe. Note that this recipe can be made in an ice cream freezer, but it’s just as good using the “lazy man’s” freezing method described below. Put sugar in a large bowl. Add boiling water and stir until sugar is completely dissolved. Add cold water, lemon juice, and zest, if using. Mix well. Lazy Man’s Method: Pour mixture into one-quart containers and freeze. To serve, microwave at 70% power for 2 minutes. Ice Cream Freezer Method: Refrigerate mixture until well chilled, then freeze in ice cream freezer according to manufacturer’s instructions. I make about 16 quarts of icee — using the lazy method and no zest — about once per week. Since we eat so much of it, I substitute Splenda for most of the sugar. I have found it doesn’t freeze well if I omit all of the sugar, but I successfully use Splenda for up to 3/4 of the sugar in the recipe. 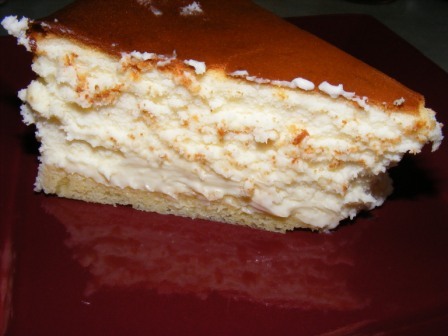 As I mentioned above, this recipe is the result of a lot of experimentation. Many of the recipes and methods I tried were a lot more complicated, but this one, in addition to being almost embarrassingly simple, produces the best-tasting lemon ice. And unfortunately for Rita’s, my wife likes my icee even better than Alex’s Lemonade. One of the things I’ve really enjoyed about the Quick Breads section of The Modern Baker is that the breads really are quick. 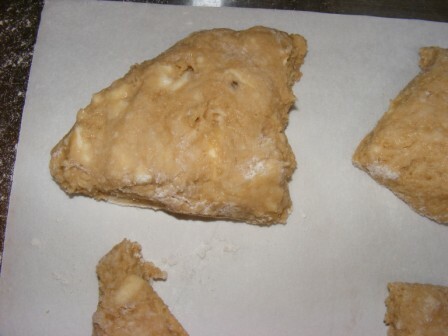 For example, in the 15 minutes it took to bake the ginger scones, I mixed up the butterscotch scones and had them ready to go into the oven as soon as the ginger scones came out. So even though I usually save my baking for the weekends, the other night after work I decided to throw together Irish soda bread muffins. I got back from walking the dog at 7:30 was relaxing in my chair by 7:50, having mixed up the muffins and cleaned the kitchen. Yes, kids, when Nick Malgieri says “quick”, he means it! This simple recipe consists of flour, baking powder, baking soda, salt, caraway seeds, unsalted butter, sugar, egg, buttermilk (I substituted buttermilk powder and half-and-half), and currants. 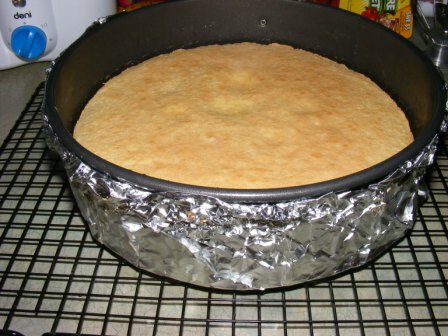 After assembling the ingredients, I lined the muffin tin with paper liners and preheated the oven to 350° F.
Next, I mixed the dry ingredients (other than the sugar) in a bowl, then whisked the butter and sugar in a separate bowl. 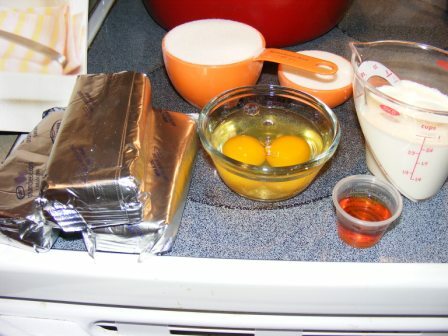 I mixed in the egg, then half the cream, half the flour mxture, then the rest of the cream. I tossed the currants with a little flour, added them to the batter, then folded in the rest of the flour. I found that an ice cream scoop was the perfect size to fill the muffin tins. I baked the muffins for 30 minutes, then cooled them in the pan. At the risk of sounding like a broken record, this was another wonderful recipe. 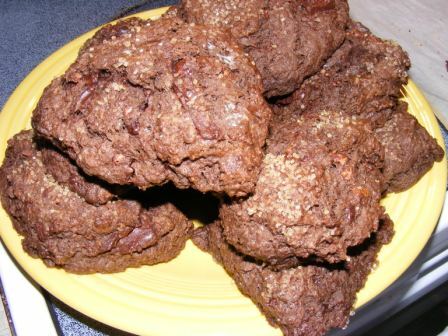 The muffins were delicious — slightly sweet and very flavorful. I especially enjoyed them with a little butter and fig preserves. So, you’ve been baking artisan breads for some time now, and you’ve finally learned how to consistently shape a nice boule. 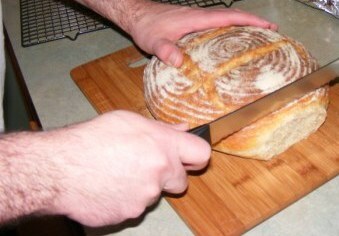 “Now”, you wonder, “how do I cut it?” Sure, you could just slice it like any other loaf, from one side to the other. 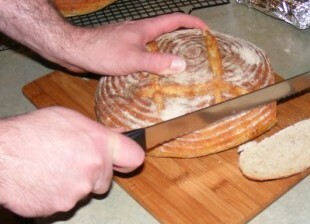 But then you’ll end up with small pieces at the ends of the loaf and giant slices from the middle. 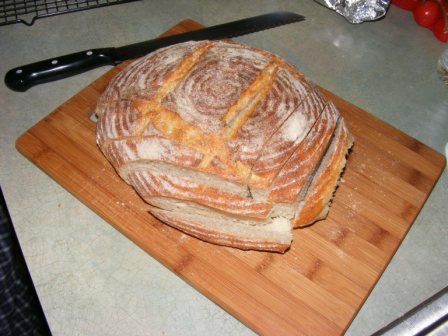 If only there was a way to cut nice, evenly-sized slices the whole way through the loaf…. Take heart, home baker, there is! All you need is a herringbone cut. Now, that may sound like some exotic technique only available to master bakers. But I’m here to tell (and show) you that you can do this at home. And you don’t need any special skills or equipment to accomplish beautiful, even slices. 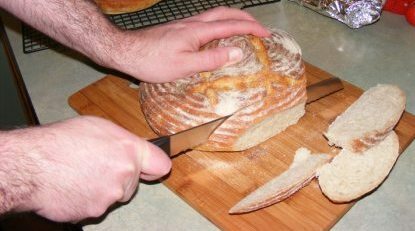 So here is a simple, easy-to-follow picture tutorial that will have you slicing your boules like a pro. First, cut a slice like you normally would. How easy is that? 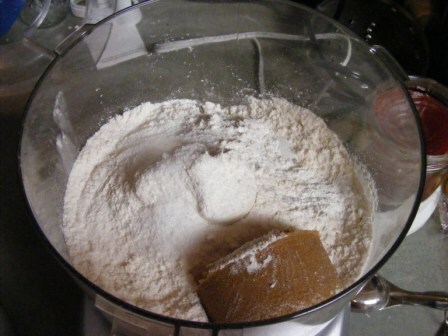 Then turn your loaf counterclockwise slightly less than 90° and make another slice. Note how that end of slice #2 overlaps the first slice just slightly. 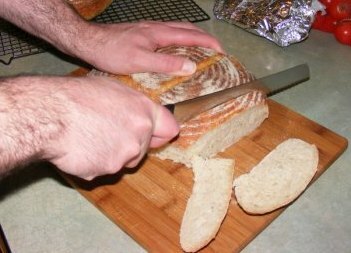 For the third slice, rotate the loaf clockwise and make the slice where you made slice #1. Counterclockwise again for slice #4, from where you made slice #2. Back to the beginning position for slice #5, and so on. See how the slices overlap like herringbone? That’s all there is to it. 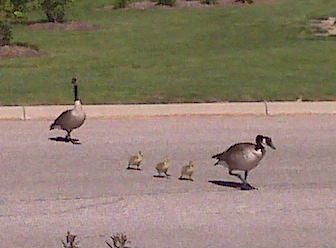 Pretty cool, huh? 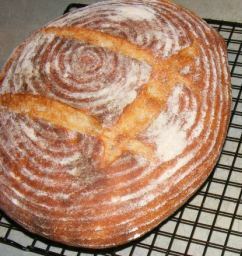 Now, go bake a boule so you can try it yourself! 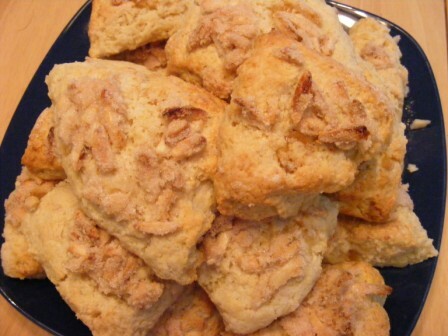 The 10th recipe (out of 15) in the Quick Bread section of The Modern Baker is Butterscotch Scones. I mixed up these scones while the Ginger Scones were baking. It took almost exactly as long to prepare these scones as it did to bake the ginger ones. First, I mixed the dry ingredients in the food processor. 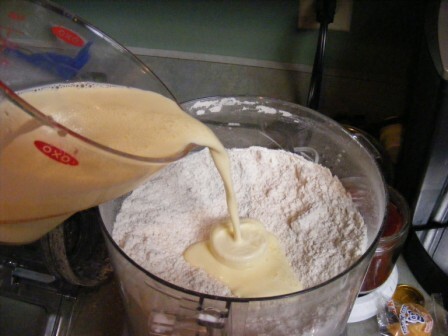 Then, I added the butter and pulsed to mix. Finally, I added the eggs and milk. After the final mix in the food processor, I turned the dough out onto a Silpat, kneaded it four or five times, then divided the dough into three pieces. I patted each piece into a round, then divided the rounds into four wedges. I baked the scones for 15 minutes, until they were well-browned. 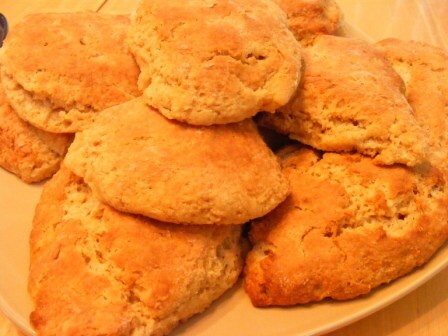 As with the ginger scones, I ate these scones fresh from the oven. 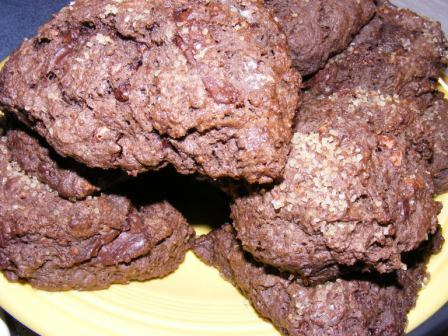 I wasn’t exactly disappointed with the taste, but compared to the ginger scones, they weren’t quite as flavorful. 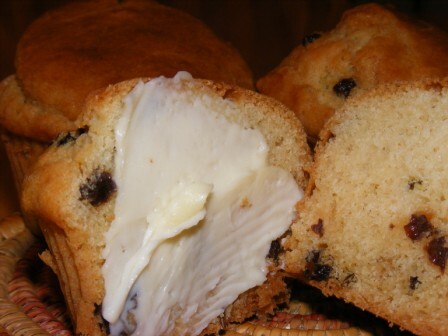 As I reread the recipe while preparing this post, I realized that I had used unsalted butter, which may explain why the scones seemed to be lacking in flavor. Even with unsalted butter, however, they were worth baking (and eating). 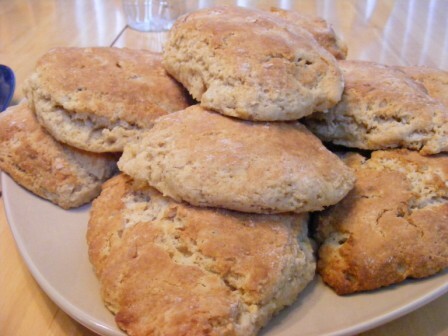 I will make these scones again, with salted butter next time, to see how they taste when they are made correctly. Updated 5/26/2010: I baked these again tonight, this time using salted butter. I could tell even before I baked them that these would have a true butterscotch flavor. And they did not disappoint. If they were good before, this time they are excellent. Every bit as good as the ginger scones, which I absolutely loved. 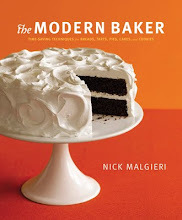 Ginger Scones with Almond Topping is another simple and delicious recipe from the Quick Breads section of The Modern Baker by Nick Malgieri. These scones came together quickly and baked up in only 15 minutes. The only ingredient that I didn’t already have in the cupboard was crystallized ginger. Nick warns against using grocery store ginger, as it tends to be dry and hard, whereas good candied ginger should be moist and tender. I was going to order ginger from King Arthur Flour, as their crystallized ginger receives rave reviews. However, I didn’t have anything else that I needed to order, and I didn’t want to wait for a shipment to get the ginger. So, I went to the grocery store to buy candied ginger from the baking section. Sure, it was dry and rattled around in the jar. But I was impatient, so I bought it anyway. When I got home, I realized that the jar of crystallized ginger contained only two ounces, whereas the recipe called for four ounces. Again lacking in patience, I decided to forge ahead with what I had. I adjusted the recipe by adding just a bit more ground ginger. As noted, the recipe came together quickly. 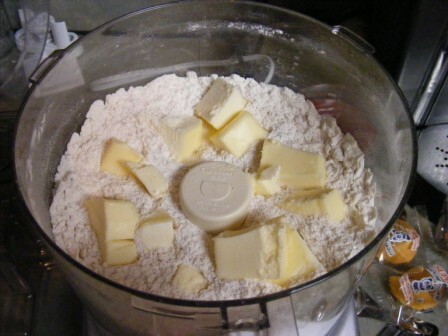 I put the dry ingredients in the food processor, pulsed them a few times, added the cold butter, and pulsed again to mix everything together. Then I added the crystallized ginger, milk, and eggs and pulsed until the dough came together. I dumped the dough out onto a Silpat, kneaded it a few times, then divided it into three pieces. After pressing each piece of dough into a disk, I cut each one into six wedges with a dough scraper. 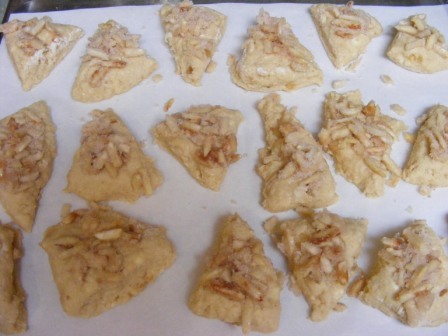 I placed the scones on a baking sheet, and topped each wedge with a mixture of egg white, almonds, cinnamon, and sugar. I baked the scones at 400° F for about 15 minutes, until they were golden brown and firm to the touch. Fortunately, Nick recommends eating these scones hot from the oven, because there is no chance I was going to let them cool. They were sweet, but not overpoweringly so, and were wonderful both plain and with a little smear of butter.